Join the fun at the Gourmet Vegetarian Dinners in Palo Alto! Please forward this to friends who may be interested! To join our email list, click here. Please visit http://peninsulamacro.org for our October/November newsletter and dinner menus. Make a date with a friend, or come by yourself and make new friends! For more Monday dinner menus, visit http://peninsulamacro.org (click on "Current Menu" along the top of the page). Be sure to join us after dinner on Monday, October 1 at 8 pm, when Kevin Strong, M.D. will speak on A Pediatrician from Maine Battles the Obesity Epidemic with DunkTheJunk.org and Macrobiotics. The problem of obesity has grown to epidemic proportions--a recent study predicts that 50 percent of adults will be obese by 2030. Current day calculations estimate an annual cost of 180 billion dollars in obesity related morbidity expense. The epidemic has far reaching and severe consequences, including the following: obesity is now the leading cause of liver disease in children--1 in 10 now suffer from nonalcoholic fatty liver disease; 1 in 10 Americans have diabetes; and when considering Americans over the age of 65, the occurrence of diabetes jumps to 1 in 4. Dr. Strong is a pediatrician in Maine who has firsthand, daily dealings with the effects of junk food and the obesity epidemic. He decided to do something about it. In 2011 he founded the nonprofit Dunk the Junk (DunkTheJunk.org), a digitally evolved, science based, nutrition education program captivating youth through street art, hip hop, and hoops. And to complement the trendy Dunk the Junk, Dr. Strong is expanding his education program to include the centuries-old approach of macrobiotics, which emphasizes eating traditional, whole, unprocessed, and local foods to move towards a balanced lifestyle which sets the stage for and encourages health and happiness. It is impossible to overlook the overwhelming volume of research, both old and new, which validates the macrobiotic approach. Jay Whitcraft has been managing the Monday dinners since Ilona Pollak ended her tenure as Dinner Manager in late July; the dinners have continued without interruption over the summer. If anyone is interested in helping Jay, or substituting for him when he is not available, contact Jay at the Monday dinner or Ken Becker at pmcdinnermanager@aol.com. For a job description (pdf) of the Dinner Manager position, click here. Michael Rossoff speaks on Why Women Live Longer Than Men. Thanksgiving Theme Dinner. Early reservations advised! For more information, along with news of Chef Laura Stec's activities in Palo Alto schools with Michelle Obama's Chefs Move to Schools program, and a thank you from Chef Susanne Jensen to those who contributed to a very successful raffle benefiting the French Meadows Macrobiotic Summer Camp, see the October/November newsletter at http://peninsulamacro.org. Recipe in this issue: Italian Giant Bean Stew by Michelle Nemer. Concerned about greenhouse gas emissions and the health of the planet? One of the best ways to reduce your carbon footprint is to choose locally grown, vegetarian foods. Try it out at the Gourmet Vegetarian Dinners in Palo Alto (where the food is actually vegan, even better)! In addition to getting a great tasting, expertly prepared meal, you'll improve your own health, enjoy a communal dining experience, and make new friends! For more information, check out the superb new book Cool Cuisine: Taking the Bite Out of Global Warming, by Laura Stec with Eugene Cordero, Ph.D. Includes recipes and cooking tips. See http://GlobalWarmingDiet.org. Celebrate Meat Free Mondays (http://supportmfm.org) at the Gourmet Vegetarian Dinners in Palo Alto! 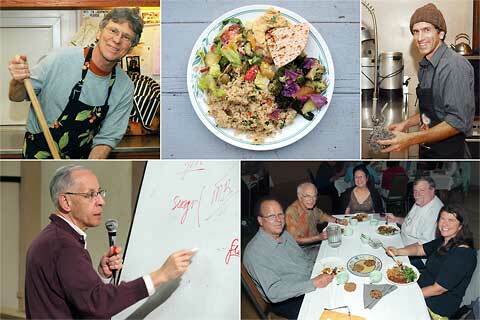 The Peninsula Macrobiotic Community serves a Gourmet Vegetarian Dinner every Monday (except major holidays) in Palo Alto. This is a full, dairy-free, vegan dinner which includes soup, grain, beans or bean products, vegetables, dessert, and beverage, prepared by expert natural foods Chef Gary Alinder, our Chef since our inception in 1987. Website: http://peninsulamacro.org - featuring newsletter, dinner menus, and related information. Chef's Blog: http://macrochef.wordpress.com - articles by Chef Gary Alinder on a wide range of topics including cooking, food, and health; a recipe archive; and much more! Meetup Group: join our group at http://www.meetup.com/Peninsula-Macrobiotic-Community-Vegetarian to receive email reminders of our dinners and make dinner reservations online. Dinner Reservations: please try to make your Dinner reservations by Monday morning, 9:30 am; call 650 599-3320 and specify either "sitdown" or "takeout". Or reserve through the meetup group. If it's after 9:30 and you're still interested in coming, call and leave a number for the manager to call you back if there is space. It is not necessary to reserve for the After-Dinner presentation. Sitdown or Takeout: dine with us or pick up a takeout. When reserving, please indicate "sitdown" or "takeout". Time: dinner is served at 6:30 pm every Monday except major holidays; the after-dinner presentation (once per month) starts at 8 pm. Location: The First Baptist Church, 305 North California Avenue at Bryant, Palo Alto, 1/4 mile East of Alma and the California Avenue Caltrain Station (map). After-Dinner Presentation: each month we feature an After-Dinner Lecture or Event, described in the newsletter and website. Lectures are usually on macrobiotic or other health related topics, by a variety of speakers including macrobiotic counselors, medical doctors, cooking teachers, and people who have dealt successfully with serious diseases using macrobiotic or similar approaches. Other events have included screenings for osteoporosis and performances by folk singers and vegetarian Chinese acrobats. We have a pass-the-hat policy for our events; we suggest a donation of $5-10. Who Should Attend: all are welcome at our Dinners, vegetarian or not. The Dinners are particularly helpful for those who want to eat in healthy ways, but may not know how to get started. Many who attend may have the same health concerns you have. Also, choosing locally grown, vegetarian foods is one of the best ways to reduce your carbon footprint on the planet. Dinner attendance ranges from 40 to 100, with a full spectrum of ages spanning newborns to grandparents, including quite a few interesting singles. Come with a friend or by yourself; singles easily integrate into our friendly group, where seating is communal. Many long-term friendships have started at a Monday Dinner, and are renewed every week! We hope to see you at a Monday Dinner! Please forward this message to friends who may be interested.